Did you ever hear the expression “a place for everything and everything in its place?” Well I am getting ready to give the family room a new look, so I am moving everything out to make it easy to paint and whatever else may have to be done. I really like to paint and wallpaper, but getting my “arse” in gear can be another matter. Well as I started packing everything away in boxes, so that decisions can be made what is staying and what is no longer needed I found sixteen bottles of wine that were put aside and forgotten about, and some may have now gone to that great winery in the sky, but that will be for future stories. 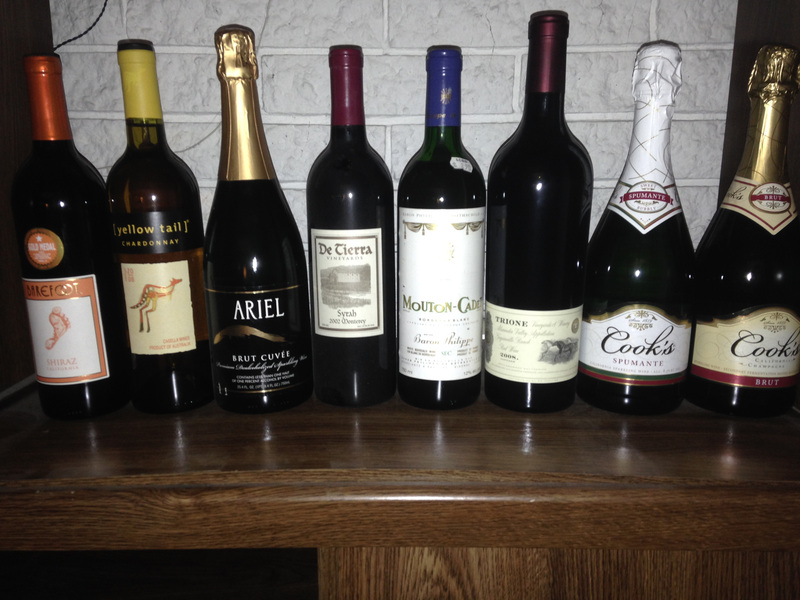 I divided the group of sixteen bottles of wine into two groups of eight and I will let you discover, as I did what I found and what my thoughts may be about their future. The first bottle is Barefoot Shiraz California NV, and I am sure that is was a gift, and there may be a fifty/fifty chance that it may still be drinkable. The next one comes from South Eastern Australia and it is Yellow Tail Chardonnay 2008 and just a visual inspection of the bottle tells me that it may have seen better days, because it looks like there is Pepsi in the bottle. Then there is a bottle that my Bride must have bought for someone that might not imbibe in wine or any alcoholic drinks. It is from J. Lohr of California and it is Ariel Brut Cuvee NV, but it is a dealcoholized sparkling wine; this is something I may just discard, if I can be so cavalier. Then there is a bottle of DeTierra Syrah 2002 from DeTierra Winery of Monterey and I am sure that it must have been from my wine club. This wine may be opened soon, just out of curiosity and I have hopes that it is still fine from this maker. Then I found a bottle that carries the famous name of Baron Philippe de Rothschild and it is the popular priced Mouton-Cadet Bordeaux Blanc Sec 1990, since this is a sweeter wine it is also a fifty/fifty odds on drinkability. The next wine is one that I hope is still in the positive side it is from Trione Vineyards & Winery of Alexander Valley AVA. It is a bottle of Trione Red Wine 2008 and is a blend of Cabernet Sauvignon, Merlot, Petite Verdot, Cabernet Franc and Malbec and this blend is in one of those heavy bottles, so I am hoping that it is still a strong contender. The last two wines are sparkling wines from Cook’s Champagne Cellars of Madera, California. The first is a Cook’s Spumante NV and the other is a Cook’s California Champagne NV and I am not sure if either of these will make the cut. 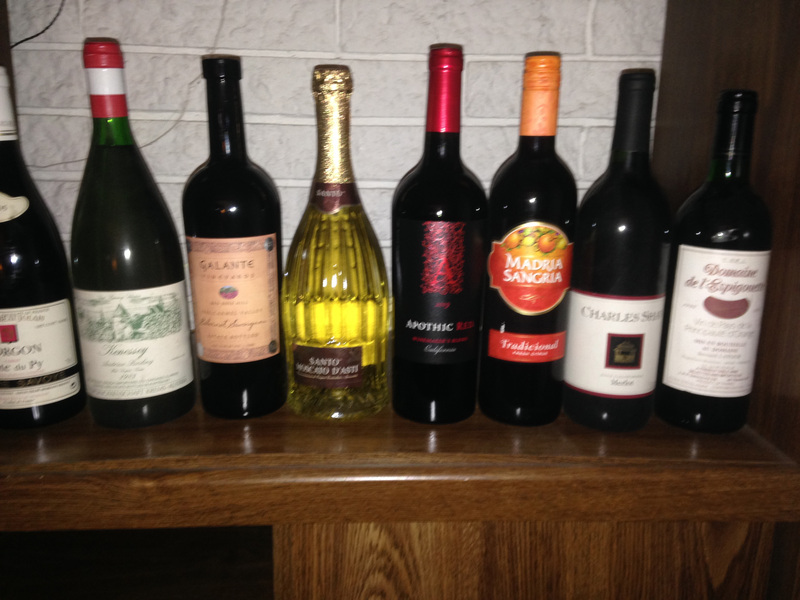 The second batch of wines that I found for this sad tale will continue. A wine by Pierre Savoye of Beaujolais his Morgon “Climat Cote du Puy” 2005, if it was just Beaujolais and especially a Nouveau, I would have my concerns, but I think this wine may make it. The next wine would have been interesting to me, as I have not had too many wines from Austria, but I am not holding my breathe for this bottle of Kenessey Riesling 1983. The next wine I know is from my wine club and I must have brought it up for a party, did not open it and it ended up lost with these other bottles. It is Galante Cabernet Sauvignon Red Rose Hill 1998 from the Carmel Valley AVA by Galante Vineyards and I am betting that this wine makes the cut. The next wine I am sure will be fine, as it must have recently been purchased to regale some of our friends that say our wines are too dry; as it is an Italian Santo Moscato D’Asti DOG Vino Dolce 2011. Then there is another popular wine that is seen in a lot of restaurants around town as it is a safe wine and I am sure that it will be fine as well. Apothic Wines Apothic Red 2009 is a blend of Zinfandel, Syrah and Merlot and while it is not a stellar wine, it will work well with a casual dinner. The next wine is one that my Bride must have bought, as she gets into a taste for this wine, and she probably finished her cycle and forgot about this last bottle, so depending on how old it is, it may still be good; a bottle of Madria Sangria NV of Modesto, California. Then there is a bottle that I am sure was a gift, a bottle of Charles Shaw Merlot 2002 of California, you may know this wine by its nickname “Two Buck Chuck” and I will not give this wine any odds, because of its age and brand. The last bottle is from some table wine that I had bought a case of years ago, and it is Domaine de l’Espigouette 1996. It is a Vin de Pays de la Principaute d’Orange, a term that is no longer used as it has been changed to IGP Vaucluse, this change occurred in 2009. The indicative blend of varietals for this wine would be Cabernet Sauvignon, Merlot, Syrah and Grenache. I would venture to say because of the provenance of this wine and not in the best of storage it may have seen better days. So here is a modern tale to admonish everyone, especially me to make sure that all wines are stored properly, and in the coming articles, I may bring up the winners and losers of this group as I have them boxed separately in the cellar now.